Strong Mind – Strong Body. A maximum strength formula to promote training, relaxation, and recovery. U4EA-X is a unique blend of natural ingredients that have been proven to enhance training, muscle development, and recovery. The formula aids in boosting motivation and focus without causing any unpleasant side effects like jitteriness or crashes. 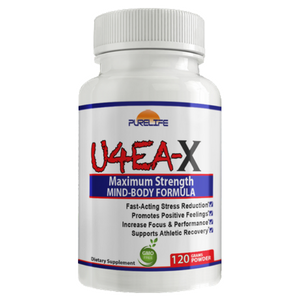 The active ingredients in U4EA-X promote the production of human Growth Hormone (hGH) to increase strength, enhance libido, and improve cognitive function. They may also work to moderate appetite to reduce binge eating while promoting healthy eating habits. Phenyl-GABA: The most potent form of the GABA available on the market; Elevates human Growth Hormone (hGH); Decreases stress, anxiety, insomnia, binge eating; Improves cognitive function. Taurine: An amino acid that increases mTOR (muscle building factor) by 400%! ; Volumizes muscles (similar to creatine); Controls appetite and insulin levels. Tri-Methyl-Glycine: An amino acid that optimizes muscle function; Slows muscle tissue breakdown; A key methyl donor involved in many enzymatic processes (liver detox.) Also optimizes brain function. L-Tyrosine: An amino acid that boosts mood, increases alertness, and relieves depression. L-Theanine: An amino acid that promotes relaxing alpha brain waves and boosts GABA levels. It also improves alertness. Oxytripan: Boosts mood; Increases serotonin levels in the brain. As a dietary supplement, adults mix 1/2 tsp. in any drink on an as needed basis. Best if taken between meals or on a light stomach. Full effects typically felt after 60-90 minutes. Best used on a cyclic or periodic basis. If tolerance develops, cease use for a week. Use caution when increasing dose. Do not exceed 1 tsp. (4000mg) per day. WARNING: Keep out of reach of children. Not intended for those under 18 years of age. U4EA-x may increase sensitivity to alcohol. Do not drive or operate heavy machinery if consuming U4EA-X with alcohol. Consult with a physician if pregnant or nursing.